Oswego, N.Y., April 16, 2019. An Erosion Management for New York’s Great Lakes Shorelines guide is now available from New York Sea Grant. The 16-page guide can be downloaded for free online at http://bit.ly/2IoF1F4 or requested from New York Sea Grant at 315-312-3042. “Erosion is a natural process and shorelines in the Great Lakes region are constantly changing shape. Developing an understanding of the natural processes at work and identifying the level of protection needed for specific sites are important considerations in planning a project,” says guide author Roy Widrig, a Coastal Hazards and Processes Specialist with New York Sea Grant, Oswego, N.Y. Readers will learn about managing shoreline properties for better drainage and bluff stabilization, nature-based erosion management features such as coir logs and sills, and traditional hard or gray structures. The guide outlines the different types of each shoreline management option and discusses the design considerations, limitations, and effects on coastal processes and delicate coastal ecosystems. · Westcott Beach State Park and Chaumont Bay in Jefferson County. To learn more about New York Sea Grant, a National Oceanic and Atmospheric Administration cooperative program of Cornell University and the State University of New York, visit www.nyseagrant.org. Have you ever walked in the silence of the woods and truly paid attention? What seems like a place where previously there existed no sound, suddenly this place comes alive with the intention of growth, the promise of a vested awareness bringing forth a fascinating garden of plenty. Yes, we do have gardens where all who tend them are blessed by the recurrent sounds and sights of what they have tended and treasured. But then there are those special communal places where the combination of many peoples directive energy comes together in a place of blessed peace. THE BUTTERFLY NATURE TRAIL in Macedon Canal Park is one of those places. Today my husband and I were enriched by the common ground fun of caring people linked together joyously, bringing forth a place just like that - the Butterfly Trail and also The Storybook Trail of our Macedon Public Library located in Macedon Canal Park, Lot #30. 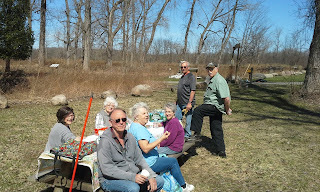 People came from far and near to prepare for those days to come when the onset of Spring awakening opens the trails to those who have treasured these places for their own personal enjoyment. Truly this is one of Macedon's hidden treasures. The Lock #30 (formerly Macedon Village Pride) volunteers have worked diligently over the years to claim this place as a place of extensive joy. Many from all over the world have come to explore the in depth experience of a walk in the park, and there are three notebooks at the Welcome Stand filled with the positive and increasingly aware comments. Drawn here by those who have walked before them, they were privileged to open new doors of nature's awareness, and content to just observe, they recorded so many beautiful things. Please feel free to experience this walk yourself, recording your thoughts and feelings re this lovely Trail.. Sometimes there is a place where beauty speaks. In this world of chaos and unexpected negative events, we are blessed to have this lovely gathering place - a place which has consistently been here for centuries, and yet we have just rediscovered its original intent. A place for those who are in need of solace, for those who have physical problems which would make it difficult for them to go elsewhere, and for children - children of all ages who have decided to remember the beauty of natural surroundings - and for those who have forgotten what it was to know childlike wonder in infinite form, where the sights and sounds of nature's echoing voice reverberate throughout the entire Trail. This morning the birds were singing - such a joyful sound after a cold and snowy winter - especially a day when the weatherman had originally declared a very rainy and windy day. It never came. The sun is shining - and it is almost 60 degrees, and volunteers are coming in all over the place to gather as a community of hopeful intent. The Lock 30 Volunteers, The Macedon Public Library's representatives and the burgeoning force field of those who are beginning to understand that this IS a lovely place to reflect, and despite any and all who would feel that they have no hope in their lives - just by coming to this place of ultimate miracles carved out by generations of peaceful people, that we are a community of hope....and isn't it an amazing and awesome journey to determine as such? In June there will be a FAMILY FUN FESTIVAL in this Park, presented by the Town of Macedon. July 27th there is going to be a wonderful heritage Event which will be sponsored by the Macedon Public Library. Please watch the newspapers for notices re these events. Mark your calendars!! More to come!! The Macedon Canal Park is coming alive!! I am in charge of the Puddle Jumpin’ 5K again this year. I would be very appreciative if you all would share the word. The money raised will go to the David Albanese Memorial Scholarship and benefit a graduating senior. I attached a PDF of the poster with all the information. 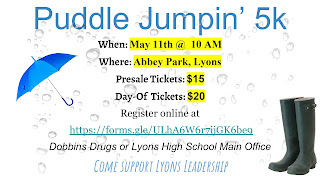 The race is May 11th at 10 am starting at Abbey Park in Lyons. Please join us, your support would be greatly appreciated on this fun day! Newark - The Newark Rotary Club will host an International Night at the Newark Public Library, 121 High Street, on Thursday, March 28th from 5:30 to 8:00 p.m.
A family affair, held near St. Patrick's Day for over 60 years, the Newark Rotary Club proudly presents it's Pancake Breakfast on Saturday, March 16 from 7:30 a.m. to 12:00 noon. a tributary of Lake Ontario in Oswego County. March 11, 2019. Like to fish? People of all ages can learn about fishing on Lake Ontario and its tributaries from professional anglers, fisheries managers, and scientists at the 2019 Lake Ontario Fisheries Symposium will be held at the Fingerlakes Mall, 1579 Clark Street Road, Auburn, N.Y., on Saturday, March 23 from 10:00 am to 4:00 pm. The symposium, with fish movement as the theme, is open to the public. There is no fee to attend, but registration is required at ILoveNYFishing.com or www.nyseagrant.org/losportfish. “The program is designed to provide new and useful information from fish basics to the latest cutting edge fisheries technology to a broad range of anglers,” says co-organizer Jesse Lepak, Ph.D., a Great Lakes Fisheries and Ecosystem Health Specialist with New York Sea Grant, Oswego, N.Y.
“Our goal is to attract aspiring anglers as well as generating interest in sustainable fisheries by raising awareness about Lake Ontario’s fabulous fisheries and fishing opportunities,” Lepak adds. Ten educational seminars will be held throughout the day with question-and-answer sessions following morning and afternoon speaker sessions. Visitors can attend any or all of the programs. There will be a variety of informational posters developed by regional fish managers and researchers, fish tank exhibits, outdoor gear vendors, door prizes, and activities, such as crafts and casting, for learning more about fish, fishing, and fisheries. Keynote speaker Silviya Ivanova, Ph.D. student with the Great Lakes Institute for Environmental Research, University of Windsor, Windsor, Ontario, will discuss her research tracking salmon and trout in Lake Ontario at 3:00 pm. New York Sea Grant, the Lake Ontario Sportfishing Promotion Council, Fingerlakes Mall, Bass Pro Shops, and other partners are sponsoring this “Fish on the Move” symposium. A complete schedule of activities is posted at www.nyseagrant.org/losportfish. For more information or directions, contact New York Sea Grant Fisheries and Ecosystem Health Specialist Jesse Lepak, 315-312-3042, jml78@cornell.edu.